Chinta Chiguru Erra Kandi Pappu. Masoor dal / red lentils are cooked in water till soft but not mushy along with dried tamarind leaves. Dal is finished with freshly fried whole spices. Serve tamarind leaves masoor dal with steamed rice or with roti. Makes: around 3 Servings of Tamarind Leaves Masoor Dal. Heat 3 cups of water in a sauce pot, add masoor dal. 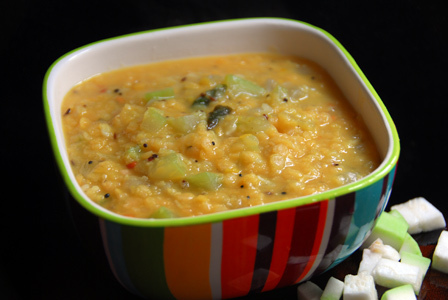 Let masoor dal cook for around 8 minutes, add the sliced green chiles. Cook for few more minutes, add tamarind leaves and half a cup of water if required. Cook for couple more minutes or until dal is translucent and leaves are cooked. When mustard seeds start spluttering, remove from heat and add to above tamarind leaves dal. Add turmeric powder and salt and boil the tamarind leaves dal for a minute and remove from heat. Serve tamarind leaves masoor dal with steamed rice or with roti. Notes: Make sure not to overcook the masoor dal. Suggestions: If tamarind leaves are not cooked well, put it back on heat, add water if required and cook till done. Variations: You can also use fresh tamarind leaves in a similar way. Other Names: Tamarind Leaves Masoor Dal, Chinta Chiguru Erra Kandi Pappu. Raw rice is coarsely ground using a grinder. The ground rice is then cooked along with masoor dal and spices till its completely cooked. Rice masoor upma can be served with mango pickle and with a scoop of yogurt. 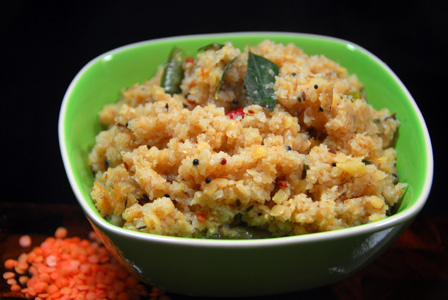 Makes: around 2 Servings of Rice Masoor Upma. Coarsely grind the rice in a spice blender or use rice rawa if available. Heat a pan on medium heat, add all talimpu ingredients in order. When mustard seeds start spluttering, pour 2 1/2 cups of water, masoor dal and salt. Bring the water to a boil, let the masoor dal cook for couple of minutes. When masoor dal is almost cooked, add ghee and rice rawa. Remove from heat and fluff up the upma. Serve rice masoor dal upma with pickle or yogurt or both. Notes: Make sure rice rawa is cooked properly before removing from heat. Suggestions: If the rice rawa is not cooked properly, add few splashes of water and cook covered on low flame till done. 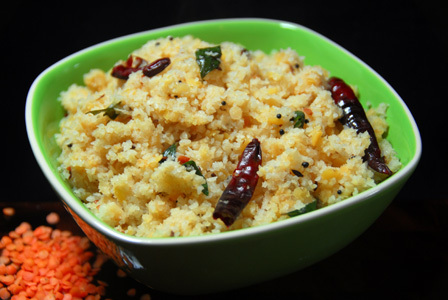 Variations: You can also look for other recipes of upma here. Other Names: Rice Masoor Upma. Masoor dal / red lentils are cooked in water till soft but not mushy. Fresh cranberries are washed and chopped up. 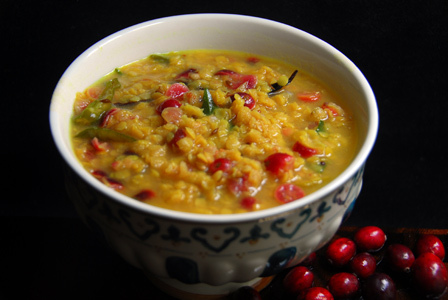 Cranberries are cooked along with the masoor dal and finished with spices. Serve cranberry masoor dal with steamed rice or with roti. Makes: around 4 Servings of Cranberry Masoor Dal. Wash and roughly chop the fresh cranberries. Let masoor dal cook for good 15 minutes or until dal is just translucent. Add the chopped cranberries, half of sliced green chiles, turmeric powder and salt. Boil for few more minutes or until cranberries are soft. Heat oil in a small pan on medium heat, add all talimpu ingredients in order. When mustard seeds start spluttering, add green chiles and sliced garlic. Fry till garlic turns light golden brown. Remove from heat and add to the above pot with cranberry dal. Boil the cranberry dal for a minute and remove from heat. Serve cranberry masoor dal with steamed rice or with roti. Notes: Make sure cranberries are cooked well before removing from heat. Suggestions: If cranberries are not cooked well, put it back on heat and cook till done. Variations: Add a pinch of garam masala once the garlic is cooked. You can also boil cranberries separately and add to the boiled red lentils if you wish. Other Names: Cranberry Masoor Dal. Masoor dal / red lentils are cooked in water till soft but not mushy. Bottle gourd is peeled and chopped up and cooked in water til soft. When the dal and bottle gourd is cooked well, its finished with spices. Serve bottle gourd masoor dal with steamed rice or with roti. Makes: Bottle Gourd Masoor Dal . Soak tamarind in few tbsps of hot water and extract all the juice. Peel, wash, remove ends and chop bottle gourd into small pieces (around 2 Cups). 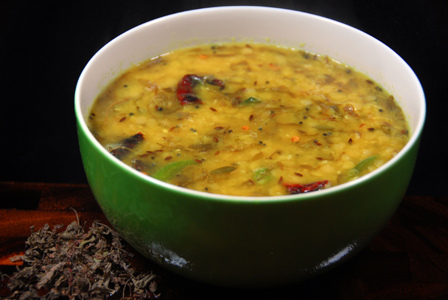 Let masoor dal cook for good 15 minutes or until dal is soft and cooked. Bring to boil around a cup of water, add chopped bottle gourd and boil till bottle gourd is soft and looks transparent. Mix cooked dal and bottle gourd together into a pot, put the pot back on heat and stir in salt. When mustard seeds start spluttering, add green chiles, grated garlic and onion. Fry till onion turns translucent, stir in tamarind extract, turmeric powder and salt. Remove from heat and add to the above pot with bottle gourd and lentils. Serve bottle gourd masoor dal with steamed rice or with roti. Notes: Make sure bottle gourd is cooked well before removing from heat. Suggestions: You can also boil bottle gourd separately and add to the boiled red lentils. Variations: Check other dal / dhal recipes here. Other Names: Bottle Gourd Masoor Dal, Anapakaya Erra Kandi Pappu.